Masaccio (1425–1426), Baptism of the Neophytes, Brancacci Chapel, Florence . This painting depicts baptism by affusion, which continues in the East except for infants, but in the West it had dropped almost completely out of use by the 15th century. The artist may have chosen an archaic form for this depiction of baptism by St. Peter. 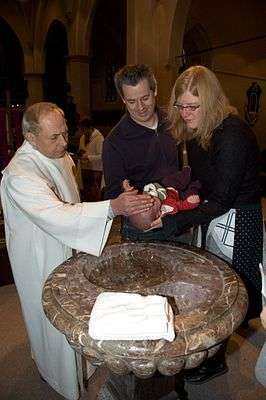 Baptism (from the Greek noun βάπτισμα baptisma; see below) is a Christian sacrament of admission and adoption, almost invariably with the use of water, into the Christian Church generally. The canonical Gospels report that Jesus was baptized—a historical event to which a high degree of certainty can be assigned. Baptism has been called a holy sacrament and an ordinance of Jesus Christ. In some denominations, baptism is also called christening, but for others the word "christening" is reserved for the baptism of infants. 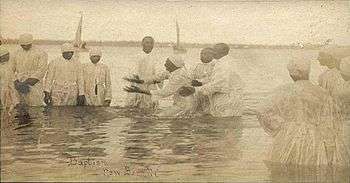 Baptism has also given its name to the Baptist churches and denominations, they being called Baptism as a whole. 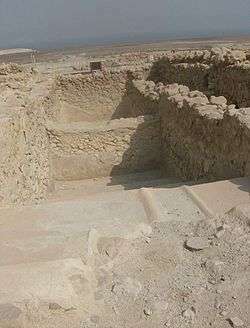 The usual form of baptism among the earliest Christians was for the candidate to be immersed, either totally (submerged completely under the water) or partially (standing or kneeling in water while water was poured on him or her). [lower-alpha 1] While John the Baptist's use of a deep river for his baptism suggests immersion, "The fact that he chose a permanent and deep river suggests that more than a token quantity of water was needed, and both the preposition 'in' (the Jordan) and the basic meaning of the verb 'baptize' probably indicate immersion. In v. 16, Matthew will speak of Jesus 'coming up out of the water'. 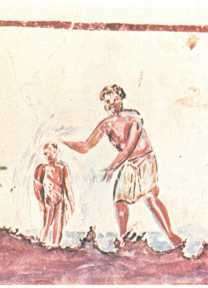 The traditional depiction in Christian art of John the Baptist pouring water over Jesus' head may therefore be based on later Christian practice." 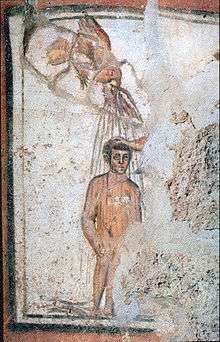 Pictorial and archaeological evidence of Christian baptism from the 3rd century onward indicates that a normal form was to have the candidate stand in water while water was poured over the upper body. 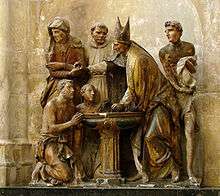 Other common forms of baptism now in use include pouring water three times on the forehead, a method called affusion. "While it is true that the basic root meaning of the Greek words for baptize and baptism is immerse/immersion, it is not true that the words can simply be reduced to this meaning, as can be seen from Mark 10:38–39, Luke 12:50, Matthew 3:11//Luke 3:16, 1 Corinthians 10:2." Two passages in the Gospels indicate that the verb baptizein did not always indicate submersion. The first is Luke 11:38, which tells how a Pharisee, at whose house Jesus ate, "was astonished to see that he did not first wash (ἐβαπτίσθη, aorist passive of βαπτίζω—literally, "was baptized") before dinner". This is the passage that Liddell and Scott cites as an instance of the use of βαπτίζω to mean perform ablutions. Jesus' omission of this action is similar to that of his disciples: "Then came to Jesus scribes and Pharisees, which were of Jerusalem, saying, Why do thy disciples transgress the tradition of the elders? for they wash (νίπτω) not their hands when they eat bread" (Mt 15:1–2). The other Gospel passage pointed to is: "The Pharisees...do not eat unless they wash (νίπτω, the ordinary word for washing) their hands thoroughly, observing the tradition of the elders; and when they come from the market place, they do not eat unless they wash themselves (literally, "baptize themselves"—βαπτίσωνται, passive or middle voice of βαπτίζω)" (Mk 7:3–4). 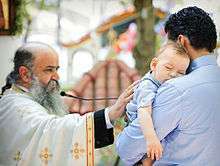 ↑ "Baptism and Its Purpose". Lutheran Church – Missouri Synod. Archived from the original on February 6, 2009. Retrieved February 24, 2009. 1 2 "Study published on the website of Pinehurst United Methodist Church" (PDF). Retrieved April 13, 2014. ↑ A. A. Hodge,Outlines of Theology 1992 ISBN 0-85151-160-0 ISBN 978-0-85151-160-3 quoted in Bremmer, Michael (September 7, 2001). 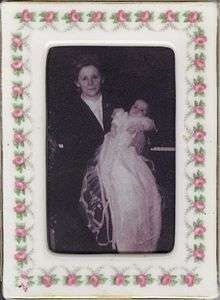 "The Mode of Baptism". Retrieved February 25, 2009. ↑ "Baptism in Jesus' Name". Apostolic Network. Archived from the original on March 2, 2009. Retrieved February 25, 2009. ↑ "Water Baptism in Jesus' Name is Essential unto Salvation". Archived from the original on April 4, 2009. Retrieved February 26, 2009. 1 2 3 4 5 Baxter, Batsell Barrett. Who are the churches of Christ and what do they believe in?. Archived from the original on January 31, 2008. Retrieved September 10, 2009. , and here , here and here "Who are the Churches of Christ?". Archived from the original on November 30, 2010. Retrieved September 10, 2009. ↑ "Baptism". Retrieved August 22, 2007. ↑ "Baptism & Communion – Willow Creek Community Church". Willowcreek.org. Retrieved April 13, 2014. ↑ "Evangelical Free Church – Site Map". Newsite3299.web07.intellisite.com. Retrieved April 13, 2014. 1 2 3 "What About Holy Baptism?". Lutheran Church–Missouri Synod. Retrieved December 2, 2012. ↑ Fundamental Truths (Full Statement). Ag.org (March 1, 2010). Retrieved on August 14, 2010. 1 2 Seventh-day Adventist Minister's Handbook, ed. Ministerial Association, The General Conference of Seventh-day Adventists (Silver Spring,Marylend, 1997), 199. ↑ "Welcome to The Vineyard Church". Thevineyardchurch.us. Retrieved April 13, 2014. Slade, Darren M. (August 15, 2014). "The Early Church's Inconsequential View of the Mode of Baptism" (PDF). American Theological Inquiry. 7 (2): 21–34.